Vehicle fitment for both eBay standards and the ACES automotive standard is compared against target databases that represent point-in-time knowledge of vehicle configurations. These vehicle datasets are created and managed by groups of people who research vehicles and record the information in vehicle tables like the eBay MPSOV and the ACES Vehicle Configuration Database (VCDB). eBay's MVL is based directly off of the ACES VCDB. Since these vehicle tables are authored by aftermarket researchers, as opposed to the OEM manufacturers, they represent a "best guess" based on information that is found on the internet and in other publications. Although painstakingly researched by qualified professionals, because of its nature, this information is never 100% accurate. What all of this means is that your fitment data, regardless of the amount of resources you've put into it, has a "shelf-life". Just like the milk in your refrigerator. And the longer you go without maintaining it, the worse it gets. Any parts and accessories that were tied to these records become Invalid. That means that your parts can not be looked up by those records in these marketplaces any more. You are not mapped to the new vehicle records that are often added to replace the old ones. These represent "Holes" in your data. myFitment automatically revalidates your data each time these standards are updated, allowing you to quickly take action to ensure your important business asset is as up-to-date as possible, and is working to increase your sales and decrease your returns. For users creating ACES data for Amazon and others, there is an additional validation feature to be aware of. ACES is different from eBay standards in that you must also specify a Part Type. This is governed by the ACES Part Classification Database (PCDB). 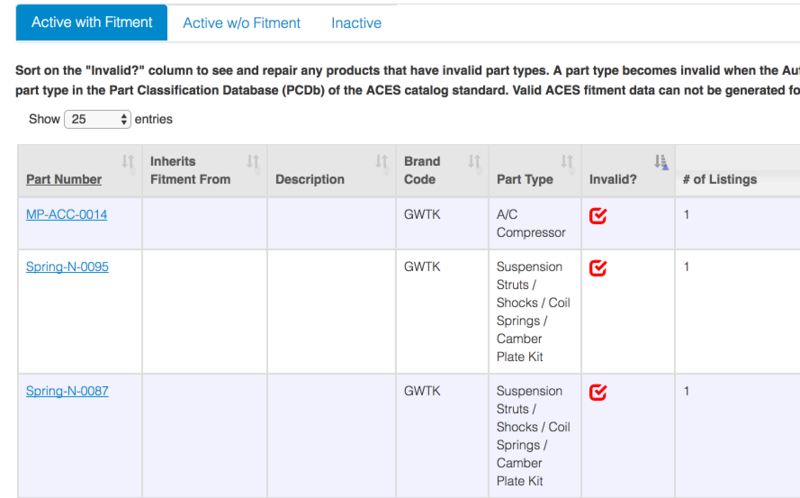 Every product that is communicated with ACES must have a valid Part Type. A current list of valid Part Types is always available in the Help --> Downloads and Templates menu. 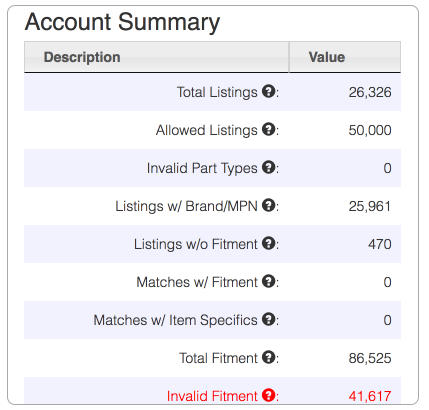 Editing each product will allow you to change the part types and mark these records as Valid once again.